Preferred Resumes provides masterfully crafted finance resumes and cover letters that cater to a wide variety of employers. Thousands of job seekers rely on our finance resume services because we are far ahead of others in the industry. Our clients, even those searching for extremely competitive finance jobs, consistently meet with success. 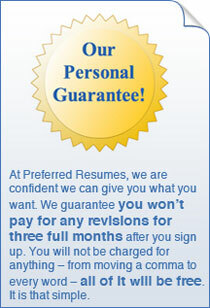 Preferred Resumes has a team of highly professional finance resume experts who excel in what they do. Time and again they have helped thousands of students, recent graduates, entry-level professionals, and executives related to the financial field to land their dream jobs through exceptional resumes and cover letters. Our writers tailor resumes and cover letters according to the unique requirements of each and every job seeker. Those job seekers aspiring for various finance jobs, such as account manager jobs, finance director jobs, senior banking analyst jobs, and auditor jobs can have their resumes drafted to their specific needs. Our writers also excel at writing exceptional finance cover letters, which play an important role in your finance resumes being noticed by employers. You will receive the first drafts of your documents within five business days of signing up for our service! You can also use the resume critique option to get a detailed and comprehensive review of your finance resume and improve the same accordingly. Create your own personalized finance resume today from the world's leading professional resume service. Sign Up Now!